Name: Every Child has a Chance! It's You! 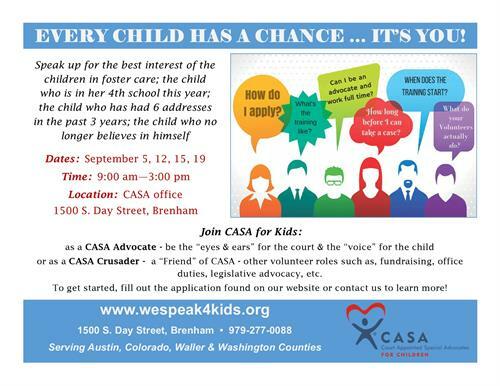 Join CASA for Kids as a CASA Advocate to be the "eyes and ears" for the court and the "voice" for the child! Apply online to become an advocate! Our next training dates to become a CASA Advocate are Sept. 5th, 12th, 15th, and 19th from 9:00am- 3:00pm. Sept. 5th, 12th, 15th, and 19th from 9:00am -3:00pm.